A file containing more than 90,000 e-mail addresses plus passwords, logins and other information was put on The Pirate Bay file-sharing site. The group said it stole the information by targeting a poorly protected server on the defence firm's network. 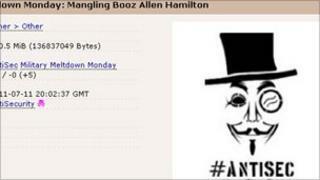 Booz Allen Hamilton declined to comment on the incident. In text accompanying the download package, Anonymous said it was "surprised" at how easy it was to infiltrate the server given the consulting firm's record of working on defence and homeland security. The attack was carried out under the banner of the "Anti Sec" campaign that was originated by the short-lived LulzSec hacking group. That hacker collective "disbanded" in late June following a spree of hack attacks on high profile targets. Many of its members are thought to have joined up with Anonymous. As well as grabbing e-mails, passwords and a copy of a database, Anonymous said it had also got hold of lots of other material that it planned to use to attack other government agencies and federal contractors. Booz Allen told Reuters it had no comment to make about the alleged attack, adding that company policy meant it could not discuss "specific threats or actions taken against our systems". Commenting on the attack, Chester Wisniewski from security firm Sophos, said the attack's significance may lie in what happens to the addresses now they have been stolen. "...there clearly is demand for information about individuals related to the US defence that can be used to compromise their accounts and computers," he wrote. The Anonymous hacking group came to prominence thanks to the actions it took in defence of the Wikileaks whistle-blowing website. Among other things, Anonymous helped to co-ordinate attacks on companies, including Mastercard and Amazon, which it felt did not do enough to help Wikileaks. The latest attack follows recent raids by police forces in Spain, Turkey and Italy that resulted in the arrest of suspected members of Anonymous.